Our team at Sydney Dance Rhythms is made of passionate and friendly dance instructors who pour their whole soul and energy into the dance lessons so students can get the best and most enjoyable experience and dance instructions in a class. Our dance instructors have been carefully chosen to inspire and motivate our young and adult students, and help them achieve great results in a dance competition (if they compete), on a stage (if they perform), in understanding body movements and rhythm. Cristina started developing her dancing skills in Ballroom, Latin and Street Latin in 1998 in her homeland of Romania where she also competed and performed. 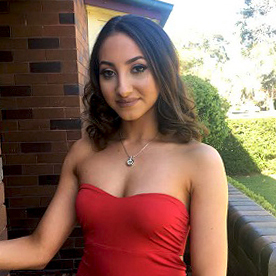 Cristina continued improving her dancing skills under many of the top Ballroom and Latin instructors in Australia and during this time she volunteered to teach so she may share her passion and love of dance with others. Whilst volunteering, Cristina decided to establish her own school - SDR was founded on this dream. Today she continues her quest for self-improvement whilst sharing her knowledge and her love of dance with her students. Cristina was a highly-qualified school teacher in Romania, and is highly proficient at the delivery of instructions. Furthermore, being a highly competent dancer, she is able to effectively communicate and instruct any combination of Ballroom and Latin Dances. Alexandra started her dance training at the age of three, and her love for performing has expanded over the years. From a young age, she has studied the disciplines of Ballet, Jazz, Tap, Contemporary, Hip Hop and Musical Theatre, as well as choreography at various events and competitions. Trained under some of Sydney’s Top Choreographers, Alexandra has completed all her necessary Ballet Examinations and has also competed in various competitions and eisteddfods. Her professional involvement in the performing arts includes travelling to the United States where she competed in National championships and performances at DisneyLand Anaheim, as well as many highly successful eisteddfods locally. Alexandra is a recent I love Dance ‘’Junior Sweetheart”; an Internationally recognised dance title highly known across the globe and was also nominated for Callback in 2016. She is incredibly excited to share her passion and love for dance with as many individuals as she can, and hopes to make a lasting impact in the lives and careers of all her dancers. Kimiko has been dancing since she was 3, training and performing in styles such as: Ballet, Tap, Jazz, Lyrical, Contemporary, Hip Hop, and more. She is currently training fulltime at ED5International and has performed in many professional shows such as ‘Candy man’ and ‘The Nutcracker’. Rey enjoys competing in Latin ballroom events; and he enjoys making sense of movement and tries to explain them in step by step logical sequence. An advocate for all-round health and fitness, Rey specialises in refining dance choreography to get the extra edge in producing sharp figures and strong lines.